Basil pesto sauce is infinitely useful in the kitchen, and can get you out of almost any dinnertime conundrum. Place the garlic in a food processor or blender, and pulse briefly to roughly chop the garlic. Add the basil leaves, pine nuts, Pecorino, sea salt, and half of the olive oil to the food processor. Blitz the mixture for 30 seconds, or until finely chopped. Scrape down the sides of the food processor. Add the remainder of the olive oil, and pulse until the oil is incorporated. Can be used immediately. Or spoon the pesto into a glass jar, smooth the surface, cover with olive oil and store in the fridge for up to one week. 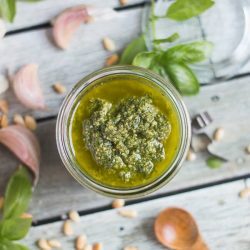 This handy basil pesto sauce can also be frozen using the instructions in the post above.